The truth about the Loch Ness Monster. 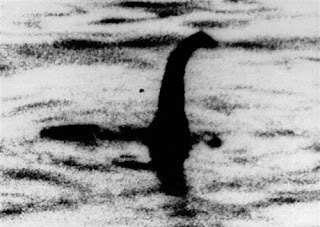 The so-called "Loch Ness monster" doesn't exist. The Aliens that built this base come from an aquatic planet called Lemaren. They also have a base in the lake Huapi and they also project it holographically. Those UFOs don't enter through the lake but through the adjacent mountains, through tunnels of several kilometers long. Grupo Elron is in telepathic communication with these extraterrestrials.cObviously with their Thetans, since in the physical plane telepathy doesn't exist. And they have communicated that they have come in peace and in a mission of study. The ships that come to Earth are not a product of their technology but from another planet more advanced and these ships are designed to make stellar trips that are kindly facilitated to them. If human beings were not so skeptical and reactive, they have contacted with our race a long time ago. Interlocutor: Well, I’ll move on to the matter of the lakes, where it seems to be real what they say "Every lake with its monster." First, in how many lakes do these kind of monsters appear like "Nessie", of the loch Ness? Ruanel: Every one of them are holographic displays, the monster that appears doesn't exist in reality. Do not confuse them with prehistoric beasts that are already extinct since millions of years ago. There are lakes that were formed after the extinction of those big beasts, so those monsters could not live there. It is a matter of common sense. Interlocutor: That is perfectly clear, Master. Ruanel: If we start saying that the dinosaurs were extinct 65 million years ago and most of the great lakes have graves of 5 to 6 million years, some of the lakes might have 25 million years, even so they were formed after their disappearance. Ruanel: Then, to speculate that in a certain lake, as the loche Ness or Nahuel Huapi, can be a plesiosaur it is too disingenuous. Interlocutor: Concretely, then, the monster of the lake Champlain is a holographic projection. Is the base now then, similar to the one located at the loch Ness? Ruanel: Correct, they are perfectly dismountable bases. Interlocutor: The aliens of the lake Champlain are the same extraterrestrials of the loch Ness? Ruanel: No, they come from different worlds. What happens is that among the same aliens their styles are copied. If something goes well and it is useful, they simply copy it, but not because they come from the same place. Interlocutor: Is the base of the lake Champlain in the bottom? Interlocutor: Do these UFOs only enter through the lake? Ruanel: No, they have caves from where they also enter. They have come a long time ago and they have built underground cities, but they are very small. They are like workshops made of a material like plastic, hard plastic. Interlocutor: Is there some reason that they don't use metals? Ruanel: Yes, because the metal is easy to detect. Interlocutor: I understand. They are under the lake or inside the lake, at the bottom. Ruanel: They are under the lake. Interlocutor: Why do they make their bases under the lakes? Ruanel: Because in those places they are surer of not being detected. Interlocutor: Summarizing, Do the space ships enter and come out through the lakes as well as through the adjacent caves to the lake? Interlocutor: Where do these aliens of the lake Champlain come from? Ruanel: They come from the system of Altair, Altair 4. Interlocutor: How are they morphologically speaking? Ruanel: They are gray, rather gray brownish, 1, 80 m. tall which is quite tall for these aliens. Interlocutor: Do they have some connection with Area 51? Interlocutor: Altair sounds familiar to me. Is there some other contingent of this place on Earth? Ruanel: Yes, they have come from Altair 3. Interlocutor: At the moment Is there an extraterrestrial base in the loch Ness? Ruanel: Yes, at this time yes. Interlocutor: What activity do these aliens of the lake Champlain carry out? Ruanel: They experiment with rocks, with soil, with manure and also with water, because the water of Earth has some bacteria that are not present in the ice of the rest of the solar system. Many times the consultants have asked why they come to take water of our lakes and this is the answer. There are asteroids with big masses of ice that the aliens use for their ships, but they don't contain bacteria, and then they use the water of our lakes. Interlocutor: How many aliens are there in this lake? Interlocutor: I forgot to ask! Who are the aliens that are at the moment in the loch Ness. Ruanel: The new aliens are since 1998 and they come from Spica. These aliens are known because from this system they have come to visit us several contingents, from Spica 3, 4 and 5. In one of them there are three different races, which means that in total there are five races divided in three planets. Interlocutor: Do they keep projecting the famous Nessie? Ruanel: No, not at this moment. Interlocutor: To have a general view, how many lakes would have in our planet extraterrestrial presence? Ruanel: On Earth there are 30 lakes with extraterrestrial bases exactly. Interlocutor: And the majority of them project some antediluvian animal to keep out the onlookers? Interlocutor: Always with the same childish idea of something like that can give results? Ruanel: Correct. The aliens forget that the idiosyncrasy of the terrestrials is to poke around, and the place where they are more interested to investigate, it’s in fact where there is some mystery to discover. Interlocutor: Is there a monster in one of the lakes, the lake Manitoba, Canada, called Minipogo or Manipogo. Ruanel: Yes, yes, they are also projections. No such monster exists. Interlocutor: This means that I can make a review of all the lakes where monsters have been seen and affirm that it is only about extraterrestrial holographic displays and in any case it is about a real monster? Interlocutor: In some moment could we make a review of what type of extraterrestrials are in every lake? Interlocutor: Well, for the moment I give this matter of the extraterrestrial bases in the lakes as finished. This entry was posted at Friday, May 01, 2009 and is filed under Extraterrestrials . You can follow any responses to this entry through the .